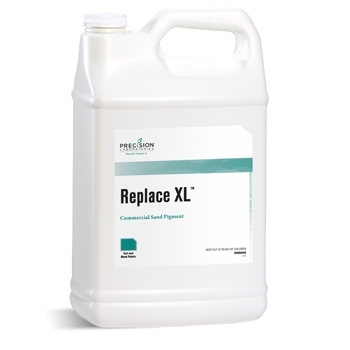 REPLACE XL is a unique pigment dispersion, formulated to impart a natural, dark green color to sand used for filling divots and topdressing playing surfaces on golf courses and athletic fields. Apply 1 to 2 ounces of REPLACE XL to 100 pounds of sand. Apply 1 to 2 pints of REPLACE XL to 1 ton (2,000 pounds) of sand. To lighten color: Add additional sand and mix until desired color is achieved. To darken color: Add additional REPLACE XL and mix until desired color is achieved.